Once you have registered for the weekend or party, you will receive an email with the details for signing up for the Jack & Jill. Alternatively, you can sign up with us during Tuesday Night Swing at Sid's Pub. The entry fee is RM10 and will be collected at the door. There are only 10 slots each for leads and follows (total of 20 participants) and there are no gender restrictions regarding the roles. This competition will follow the common format consisting of a 3 round preliminary whereby competitors dance to 3 tempos ranging from 140 - 200bpm. ﻿Depending on the number of entrants, competitors may be split into two heats. For the finals, competitors will be paired and judged as a couple and dance to various tempos. Scoring will be based on relative placement to ensure a fair competition. 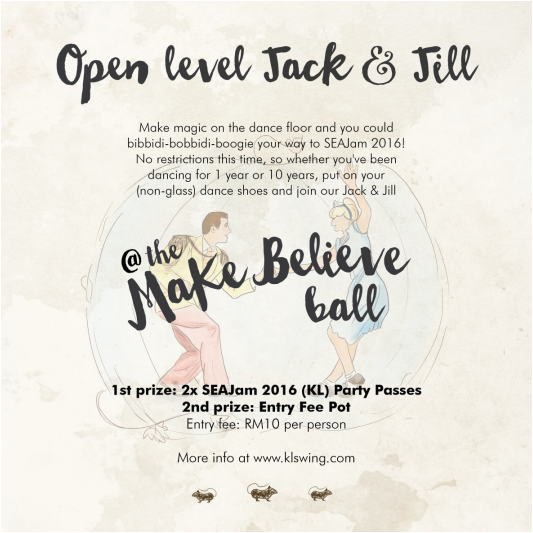 GRAND PRIZE: 2 party passes for next year's SEAJAM! It will be a 5 day extravaganza that starts in Singapore and ends in Kuala Lumpur. These party passes cover the KL segment which includes 3 parties with live music and all the fabulous teachers in attendance! The first runners up will receive the entrance fee pot. Don't spend it all at once!